Lewisham Street Pastors have been patrolling the streets on Friday or Saturday nights for over 10 years, listening, caring and helping those people found out and about during the early hours. 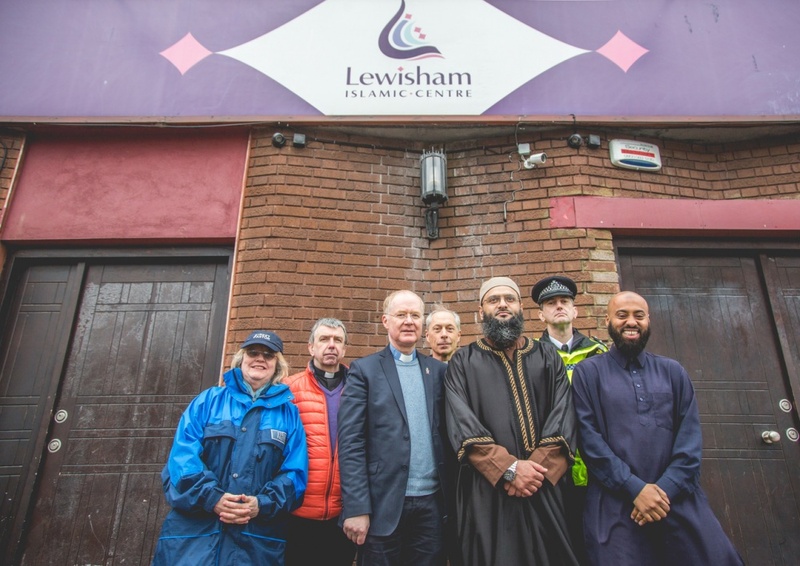 More recently we have trained School Pastors who patrol a local secondary school at lunchtimes, building relationship with both pupils and staff. We have a faithful team of prayer pastors who cover us every time we are out on the streets. 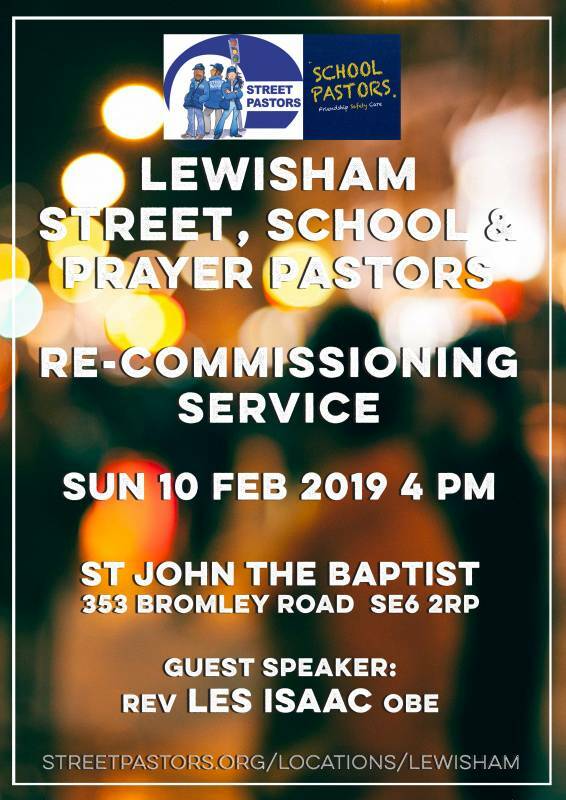 The Recommissioning Service on 10 February is an opportunity to tell stories of what’s been happening, be grateful to our Street, School and Prayer Pastors, and recruit new people to this exciting and essential work. 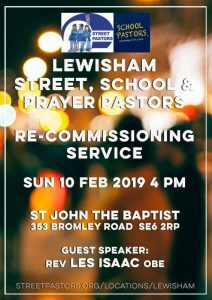 We’re excited to have Rev Les Isaac OBE, founder of Street Pastors, speaking at this event. 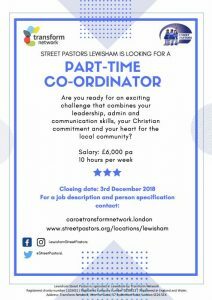 Growing the work of Schools Pastors in the borough would also be a part of the remit. 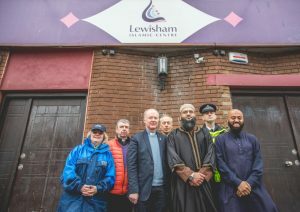 The post is managed by the Transform Network Charity, which is based in Sydenham. You will be able to engage people from different church backgrounds, as well as develop links with local voluntary and statutory groups. Prayers and support go out to everyone affected by this. Sad times. On Sunday 21 May the Inter Faith Walk for Peace took place in Lewisham. Amongst the walkers were about ten Street Pastors. People from different faiths, and no faith, the Police and local politicians, walked from Catford Synagogue to St Laurence’s who hosted a fabulous lunch, then on to the Civic Suite where Mayor Steve Bullock lit a candle. 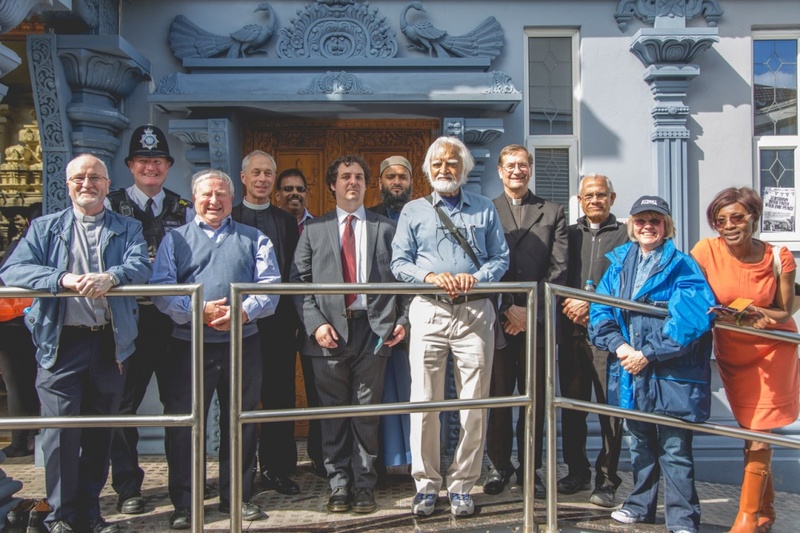 We then walked to Lewisham Islamic Centre and finally to the Sivan Hindu Temple. Thank you Team D for making a difference to this lady’s evening. 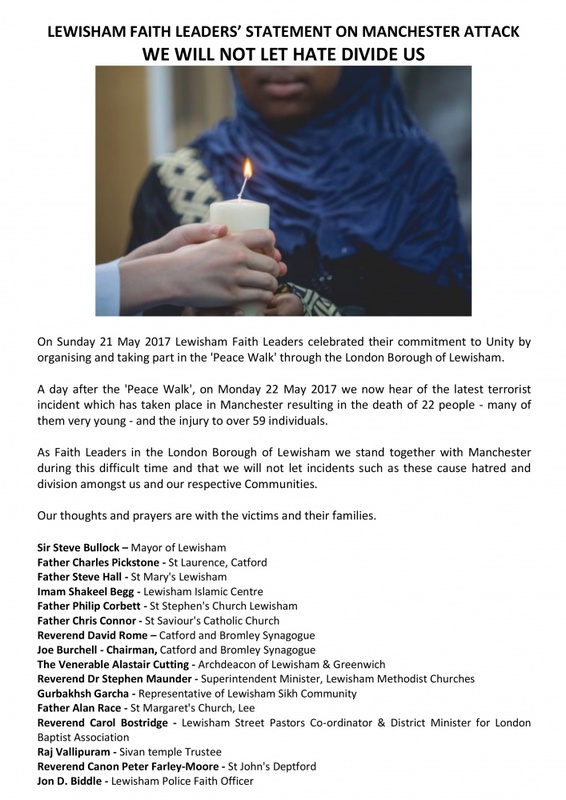 Lewisham Faith Leaders stand together in condemning the terrorism incident that took place on Wednesday 22 March 2017 at Westminster which claimed innocent lives and caused serious injuries to dozens more. Our thoughts and prayers are with the victims and their families. 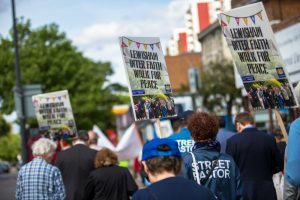 Heinous acts such as this, perpetrated with such callous brutality, can never be justified, and the Lewisham community stands in absolute solidarity with the people of London in this difficult time. We would like to thank the Police and Emergency services for their swift actions and bravery in the face of life-threatening danger. We also pay tribute to the ordinary persons at the scene displaying courage and selflessness in tending to the wounded. 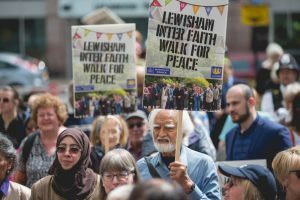 While we await further news on Wednesday’s tragedy, we invite everyone in Lewisham and beyond to join our Annual Walk for Peace on 21 May 2017 that celebrates our strength in diversity while promoting peace, justice, mutual respect and tolerance.